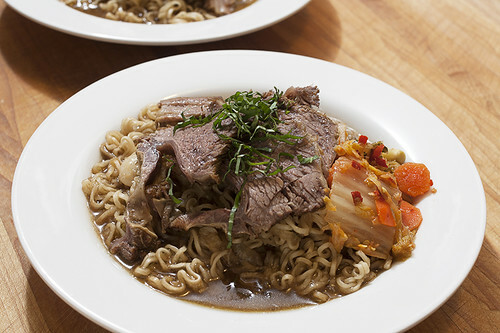 grass-fed beef short rib ramen in beeftacular broth, originally uploaded by aarn! +3rd August, 2011+. cut a 1-lb chunk of grass-fed beef short rib (fresh off the moo from verrill farm in concord, ma) into two rib sections, each with a bone. braised the short rib parts in some well-seasoned braising liquid that had been previously used for beef oxtail once and beef short ribs once before (strained through a fine sieve after each use). simmered the beef in the braising liquid for about three hours over low heat. let cool a little and packaged in some liquid and let sit over night in the refrigerator. broke through the beefy fat cap the next day and pulled out the short ribs, discarded the solid pieces of beefy fat, and set aside the remaining stock. pulled the bones out of the short ribs, being careful to preserve the delicious cartilage surrounding the bone, and sliced all of the meat into quarter-inch thick slices. placed in a covered bowl and gently reheated the meat in the oven while the rest of the meal cooked. thinly sliced half of a large onion into rainbows, and caramelized with a little olive oil in a deep sauce pan. added some cloves of olive oil poached garlic and some of the garlic olive oil, and the finely sliced tips from two applewood smoked serrano peppers. added 1-qt of the beefy braising liquid, about 1-1/2c. of water, a dash of soy sauce, 1t. white miso paste, and salt and pepper to taste. brought to a near boil, then added two blocks of curly ramen noodles. cooked until noodles were tender, then plated the broth and noodles in some wide rim pasta bowls with some of the warm sliced short rib meat over top, a little fresh basil and salt sprinkled over the beef, and a side of christine’s famous vegan kimchee.